Klamath bed and breakfast travel guide for romantic, historic and adventure b&b's. 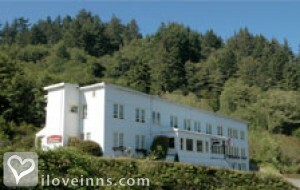 Browse through the iLoveInns.com database of Klamath, California bed and breakfasts and country inns to find detailed listings that include room rates, special deals and area activities. You can click on the 'check rates and availability' button to contact the innkeeper. Klamath is an exciting community inside the Yurok Indian Reservation in Del Norte County, California. Klamath is one of the best salmon fishing destinations in the entire country and the town also offers other amazing tourist attractions such as the famous TREE of Mystery which features a ten meter statue of Babe the Blue Ox, the legendary associate of Paul Bunyan and the mythical lumberjack himself. Enjoy a trip on the Klamath River Jet Boat Tours. Boat and fish at the many designated fishing stations across the river. Book you and your companions at any of the many Klamath bed and breakfast inns. Explore the Redwood State and National Forests. Hunt for agate, small rocks that are amazingly beautiful and translucent, while in Klamath. By Historic Requa Inn.